Experience An AVE Train Trip Before Seeting Foot On The Train! Would you like to know how is an AVE train trip? For those of us, frequent train travelers, catching a train becomes a routine like taking a bus or a plane. 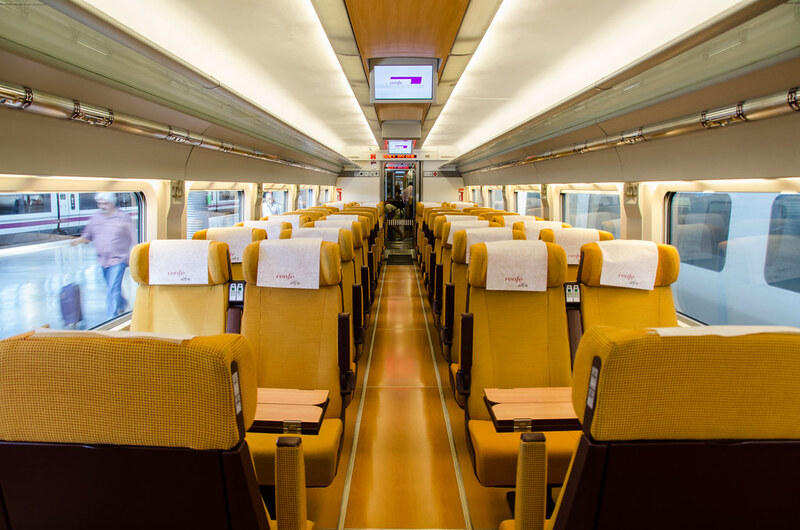 But if it’s your first time traveling in a high-speed train, you may still have some questions. 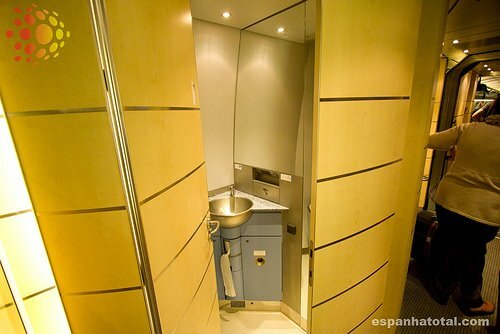 This is a full description of how it is to travel in an AVE or any other high-speed train. The only thing that I won’t be able to reproduce is the thrill of traveling at more than 300km/h! On the day of your trip, make sure that you have your tickets with you, either printed or downloaded in your smartphone or tablet. You will be requested to show your ticket before boarding the train. Have a look at the monitors to check your train’s departure platform number. If you have a Preferente ticket, go to the VIP lounge (Sala Club) where you can wait comfortably. 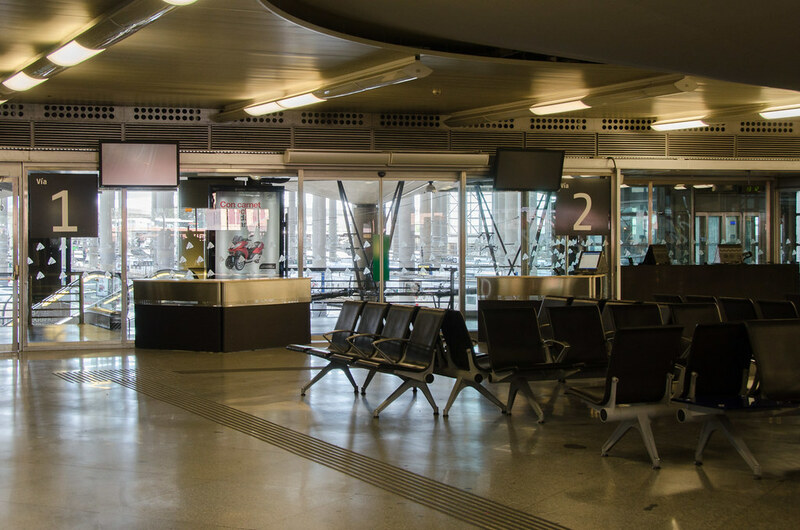 Make sure that you can access the Sala Club before going through the security control, in some stations (e.g. 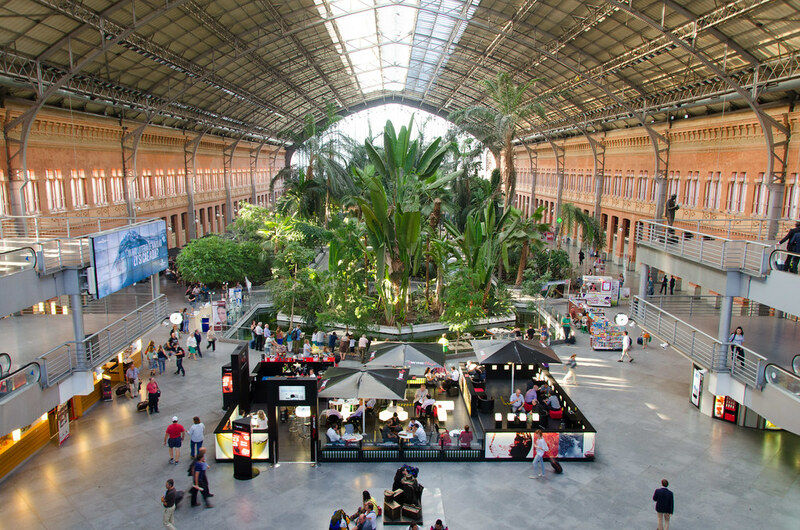 Atocha in Madrid you need to go through security first). 1. A security control. At the control, you must x-ray all your belongings (luggage, backpacks and bags) and show up your train ticket upon request. 2. A platform access control. Here a member of Renfe will scan your ticket. This procedure varies from one station to the other. In Barcelona-Sants the luggage control is done first; you then access a waiting hall before going downstairs to the platform where the train is and where your ticket will be scanned. In Madrid-Puerta de Atocha the luggage control is done first. You then access a waiting hall with several gates. Your ticket will be scanned at one of these gates before going downstairs to the platform where the train is. 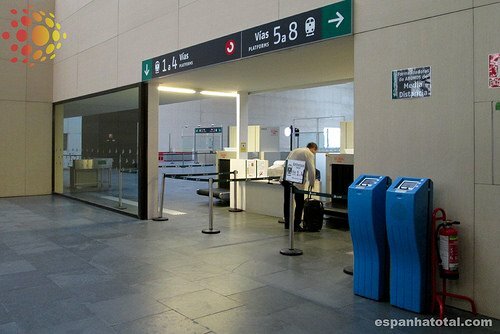 In Sevilla-Santa Justa you are first asked to show the ticket before accessing the ramp leading to the platform. 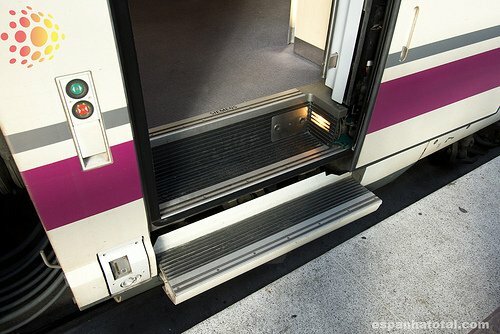 Once downstairs, you go through the luggage control and finally, a Renfe staff member scans your ticket. In Toledo both the luggage and access control are done at the platform where the train is. 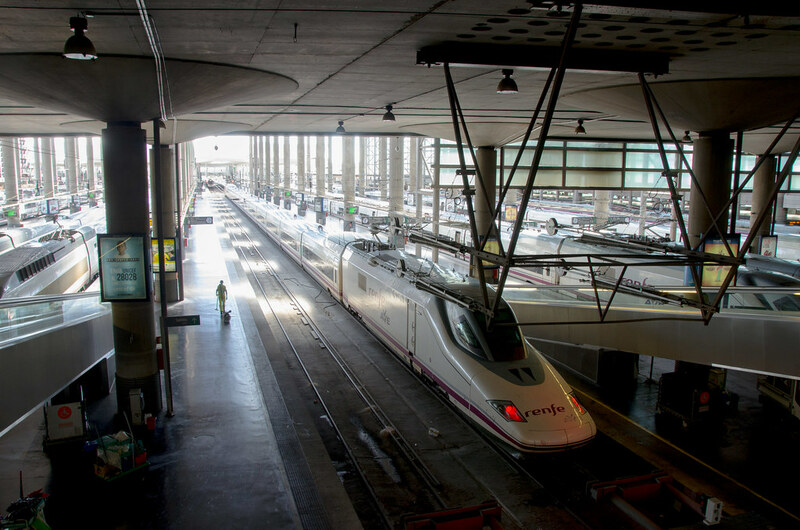 In Zaragoza-Delicias the luggage control is done first; you then access a waiting hall before going downstairs to the platform where the train is and where your ticket will be scanned. 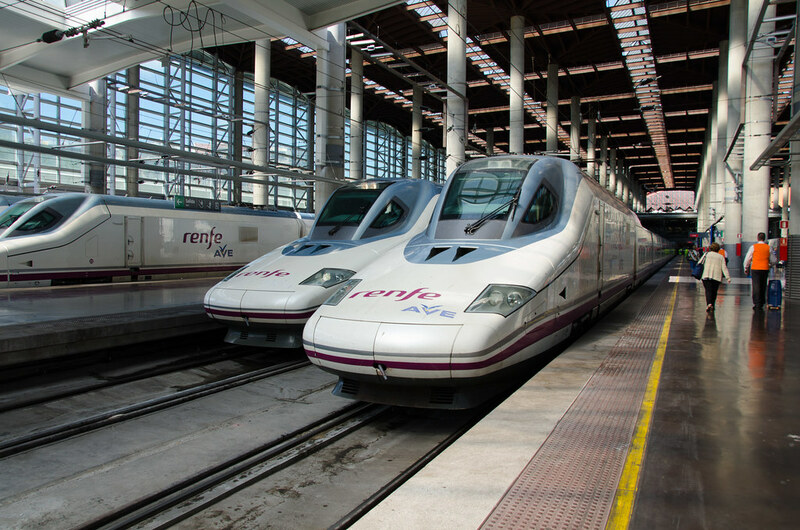 When the Renfe staff member scans your ticket, he/she will tell you your car’s location. 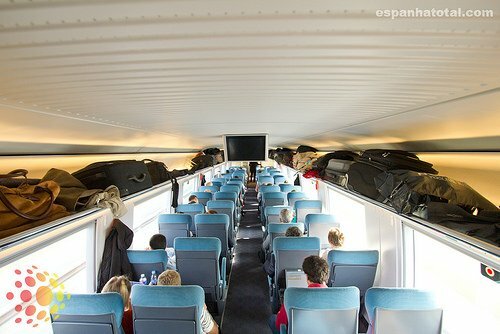 As soon as you enter the train, you should look for a place to store your luggage. 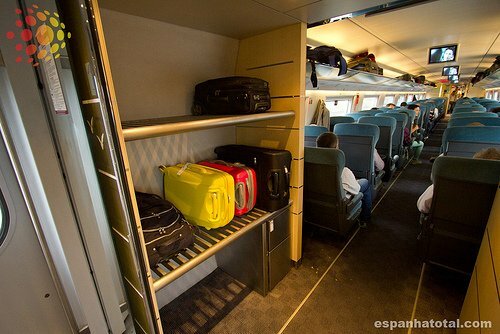 Make sure you travel as light as possible as I recommended when explaining Renfe luggage restrictions. The baggage store shelves are generally at the beginning and end of each car, although this varies depending on the train model. 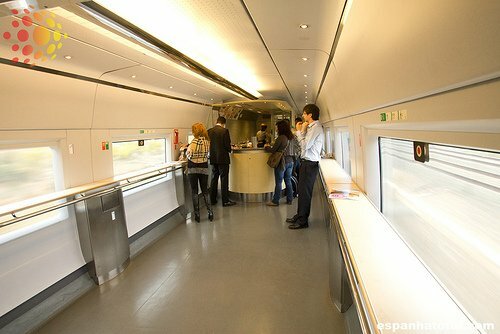 In general there is not a lot of space so it fills up rather quickly, especially if the train is full. In addition to this, you can also store your hand luggage, backpack or bag at top shelves located over the seats. If you purchased a ticket with a Mesa tariff your seat will be around a table. In case you have no clue what a Mesa tariff is, read more about the ticket fares. Depending on the train, it can stop once or several times along the trip. The stops are very brief, only a few minutes so that other passengers can get out and in the train. As soon as the train reaches your final destination, make sure you take all your belongings with you. Exit the car paying special attention to the steps and the gap between the train and the platform. Now all you need to do is follow the rest to exit the platform and enter the main terminal. Your AVE train trip is over. Disclaimer: This post was written in partnership with Espanha Total, a specialized online tourist guide about Spain in Portuguese.